Christine McCrea and Wannick WH. Photos ©Sportfot. 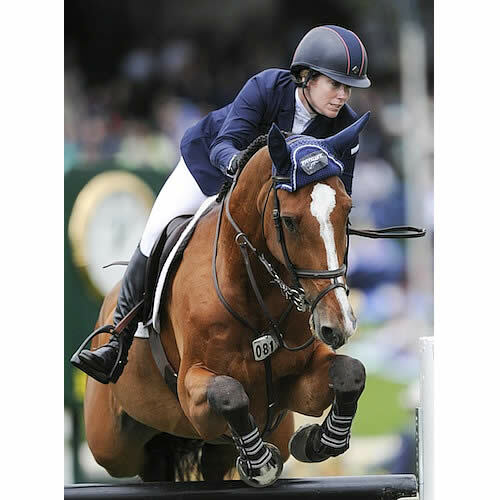 Mill Spring, NC – May 31, 2015 – Christine McCrea of East Windsor, CT and Candy Tribble’s Wannick WH concluded Tryon Spring 7 with a win in the $25,000 Grand Prix at Tryon International Equestrian Center (TIEC). The duo bested the six-horse jump-off with a time of 41.528 seconds. Lucas Porter and Sleepy P Ranch, LLC’s Doma Sue finished followed in second, completing the course in 44.517 seconds. Kady Abrahamson and Abrahamson Equestrian LLC’s Bamiro placed in third, riding clear in 45.322 seconds. Competition at TIEC begins again on Wednesday, June 3, with the start of Tryon Spring 8 CSI 4*, the last week of the Tryon Spring Series. McCrea and Wannick WH were the last pair in the George H. Morris Stadium for the jump-off, riding in hot on the heels of Lucas Porter and Doma Sue, who had just put in the fastest clear round of the jump-off. McCrea had scoped out the tracks she believed would save her time on course and made two bold inside turns to ultimately finish three seconds faster than Porter. “Winning here in Tryon feels great. It’s our first time here and I was so impressed with how everything went this week. I thought this class would be great for him so we went today and got really lucky,” said McCrea. The duo has built a solid partnership together as Wannick WH has been with the McCreas for nearly seven years. McCrea knows the ins-and-outs of the stallion’s style and the win today served as a great moment for the pair. Abrahamson and Porter were the first two riders to finish with clear rounds in the jump-off and McCrea knew she was going to have to ride competitively to keep all of the rails up and lay down a fast and efficient ride. “The kids really put the pressure on this old lady today,” laughed McCrea. “To be honest, I wasn’t sure that I wanted to go inside to the double because it was quite short but I said to myself, ‘Okay, we’re going inside of the double and if you clear that then you have to make an effort to get inside of the next two standards,'” she explained. “I sort of forced that turn but he slowed down and that allowed me to turn him quite tight and I got a great line. It really worked out to my advantage. It almost gave him enough of a half halt to rock back on his hocks, which pushed us through the next fence. Christine and her husband Jonathan will stay at TIEC to contest the next week of FEI CSI 4* competition before returning to Connecticut for small summer break. The duo has a strong string of horses here and will look to continue their winning ways moving into Tryon Spring 8 next week. Adding TIEC into their show schedule has been a huge advantage for McCrea, as she can not only compete in FEI sanctioned competitions on U.S. soil, something she has been looking forward to for a long time, but also gives her the opportunity to choose from a wide range of classes and decide which are most fitting for her horses. Lucas Porter has been a force at Tryon International Equestrian Center this week, collecting several top finishes in both the jumper and equitation rings. Finishing his first week of competition at TIEC, Porter collected second place in the $25,000 Tryon Grand Prix after winning the ASPCA Medal Maclay earlier in the day. Porter rode Sleepy P Ranch, LLC’s Punch to victory in the Maclay and piloted Sleepy P Ranch’s Doma Sue to a second place finish in the Grand Prix. Porter and his equitation mount Punch gathered wins in the ASPCA Maclay and the USEF Pessoa Hunt Seat Medal during Tryon Week 7. Punch has been an important horse in Porter’s young career, as he has helped him to better his position and give him experience in the equitation and hunter rings. When Porter is competing, it is all hands on deck to ensure that he gets to each of his rings on-time, as he has a number of horses entered in classes throughout the grounds. Today was no different, as he hopped off of his ride in the Junior/Amateur Owner Medium Classic and headed straight to the equitation ring for the ASPCA Maclay and the USEF Pessoa Hunt Seat Medal. The Porters and the Sleepy P Ranch team will continue competing at TIEC through Tryon Spring 8 of the Spring Series and have been thoroughly impressed with the facility and competition. Tryon Spring 8 CSI 4* will begin on Wednesday, June 3, and will continue through Sunday, June 7. Tryon Spring 8 will be the biggest week of the Tryon Spring Series, hosting FEI CSI 4* competition alongside an array of activities for the general public to enjoy at the venue including the Festival of the Carolinas Craft Beer Festival, the unveiling of the Rolex Clock Tower and much more on Saturday, June 6. For more information on the competition and the events to come at TIEC, please visit www.tryon.com. Please “Like” the TIEC Facebook page at www.facebook.com/tryonresort to be eligible for various contests and promotions. Lauren Tisbo and Roundthorn Madios. Photos © Spruce Meadows Media Services. Calgary, AB – July 4, 2013 – The ‘North American’ Tournament had three international competitions today in two rings. Riding to the top of the standings in the $35,000 PwC Cup 1.60m was Lauren Tisbo (USA) on Roundthorn Madios. Christine McCrea (USA) won the $35,000 Progress Energy Canada Cup 1.50m as the first in the jump-off with Romantovich Take One. In the All Canada ring, an early fast round by Abigail McArdle (USA) and Cosma 20 won the $33,000 Zoetis Horse Health Care Cup 1.45m. Twenty entries went to post in the $35,000 PwC Cup 1.60m over a course designed by Anthony D’Ambrosio of New York. Only two were able to clear the first round, and they went head to head in the jump-off. First in was Reed Kessler (USA) on Cylana. They pulled a rail at the first fence in the jump-off and finished with four faults in 39.76 seconds. Knowing a clear round was needed to win, Lauren Tisbo went in with a steady stride, but still kept up a pace just in case. She was able to leave all of the jumps up and recorded a time of 41.20 seconds for her second international win at Spruce Meadows. Tisbo recently moved Roundthorn Madios up to the 1.60m competitions, and she used today’s event to see if he would be ready for the $200,000 ATCO Power Queen Elizabeth II Cup on Saturday. “From the beginning today was all about jumping clear, and if I got into the jump-off, jumping clear again. My plan just happened to work out with the rest of the circumstances,” she pointed out. The $35,000 Progress Energy Canada Cup had 35 entries and five of those would advance to the jump-off, but it would be the first in the ring over the shortened course that would lead the way. Christine McCrea and Romantovich Take One, 13-year-old Dutch Warmblood gelding by Numero Uno x Karandasj owned by Candy Tribble, put in the all-important clear round in a time of 42.58 seconds. Next in, Federico Fernandez (MEX) and Gitano, had an unfortunate 12 faults in 47.97 seconds for fifth place. Conor Swail (IRL) and Lansdowne had an early four faults and slowed down to finish the jump-off. They accumulated three time faults in 52.77 seconds for fourth place. It came down to the final fence for the last two riders, and both of them had their heartbreaking four faults there. Lauren Tisbo (USA) and Catharina 9 were third in 45.34 seconds. Susan Artes (USA) and Zamiro were quite fast in 41.72 seconds, but the rail down left them in second place. 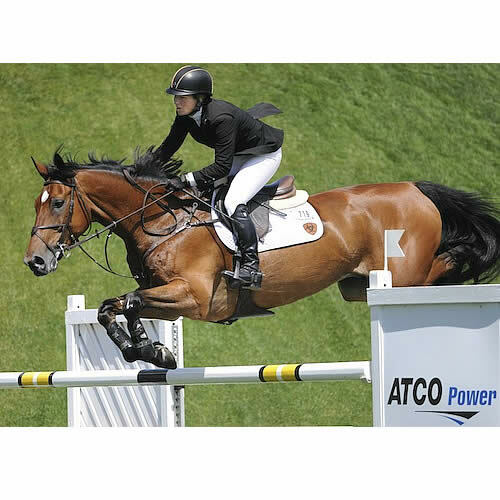 This was Romantovich Take One’s third victory in the Spruce Meadows Summer Tournaments, and McCrea has had success on her other horses as well. “I’m very lucky. They are extremely nice horses and I’m really happy to have them,” she expressed. The $33,000 Zoetis Horse Health Care Cup 1.45m had an early leader whose time held up to win the competition. Abigail McArdle (USA) and Cosma 20 went sixth in the order out of 23 entries and put in a very quick time of 104.82 seconds with no faults. Going second to last, the closest clear round came from Francois Mathy (BEL) on Falco von de Clehoeve, who finished in 108.39 seconds for second place. Shane Sweetnam (IRL) and Cyklon 1083 were third in 108.69 seconds. Conor Swail (IRL) and Martha Louise had the time in 103.67 seconds, but a rail left them in eleventh place. McCrea and Romantovich Take One. 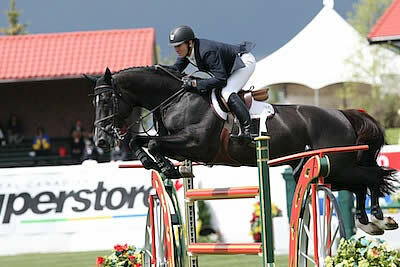 Photo © Spruce Meadows Media Services. Calgary, AB – June 14, 2013 – Riders at the Spruce Meadows ‘Continental’ Tournament had to deal with incoming rain and storms today, but it didn’t dampen the level of competition. McLain Ward (USA) and Grant Road Partners’ Super Trooper de Ness were fastest in a large field of 75 to win the $33,000 AltaGas Cup 1.45m. Christine McCrea (USA) and Romantovich Take One, owned by Candy Tribble, were best in the $33,000 Scotiabank Cup 1.50m. The ‘Continental’ Tournament CSIO-W 5* runs June 12-16. The highlight class of the weekend is the $200,000 CN Performance Grand Prix CSI-W on Sunday, June 16. There will be complimentary admission and parking for spectators during the ‘Continental’ Tournament. 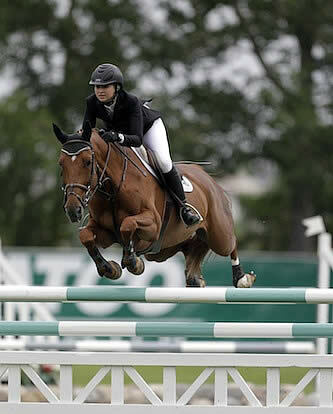 In the $33,000 Scotiabank Cup 1.50m competition, the format was changed from jump-off to speed in order to avoid more inclement conditions coming later in the evening. There were 27 entries in the class, and nine of those had no jumping or time faults. The winner of the class, McCrea and Romantovich Take One, a 13-year-old Dutch Warmblood gelding by Numero Uno x Karandasj, finished in 64.647 seconds. Francois Mathy (BEL) and Polinska des Isles finished second in 66.242 seconds. Third place went to Wilton Porter (USA) and Paloubet, who had a time of 66.323 seconds. She praised the course set by Leopoldo Palacios of Venezuela, and said there were a couple spots that were set to test horse and rider. “The double (combination) with the brown poles are always hard for the horses to see. Luckily my horse has a lot of experience so he handled it well. The skinny is always a bogey jump,” she noted. 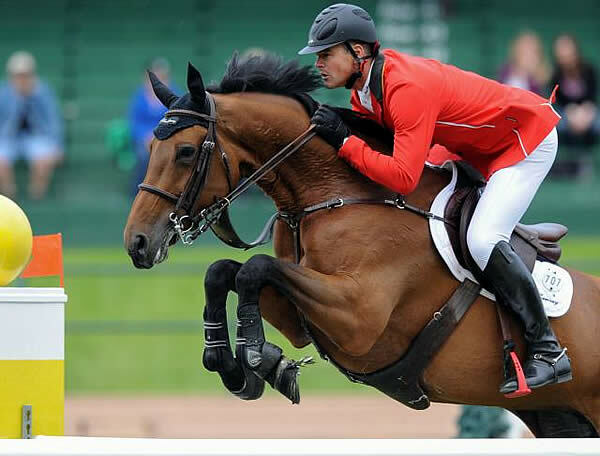 In their second major victory at the 2013 Spruce Meadows Summer Tournaments, Ward and Super Trooper de Ness, an 11-year-old Belgian Warmblood stallion by Vigo D’Arsouilles x Polydor, beat 21 others in the jump-off of the $33,000 AltaGas Cup 1.45m. They finished clear in 41.11 seconds. Second place went to Conor Swail (IRL) and Martha Louise, who finished in 41.47 seconds. Brian Morton (CAN) and Spitfire recorded a time of 42.11 seconds for third place. Ward said he “lucked out” with the weather on Super Trooper. “It kind of worked out alright for him. We were in the first phase and the weather was beautiful. Then the weather came in and went out again before our jump-off. It certainly helped,” he said. Believing that the double combination of verticals would be the tricky part of the jump-off course, since it was “off a blind turn” and Super Trooper is “very careful in combinations,” Ward was more aware there. But heading to the last two jumps, he was able to let him go more. “I knew rolling left to the second to last and last (fences), he’d be very quick. I didn’t have to check him too hard to the last (fence) on that long run. I went in thinking I was going to jump the round I want to jump and if it wins, that’s great, and if it’s second or third, I could live with it,” he explained. Having found Super Trooper almost three years ago in England through Francois Mathy, Ward knew that he would be a top horse, but after a bout of colic and Ward’s injury last winter, it has taken more time than expected to get him to this level. 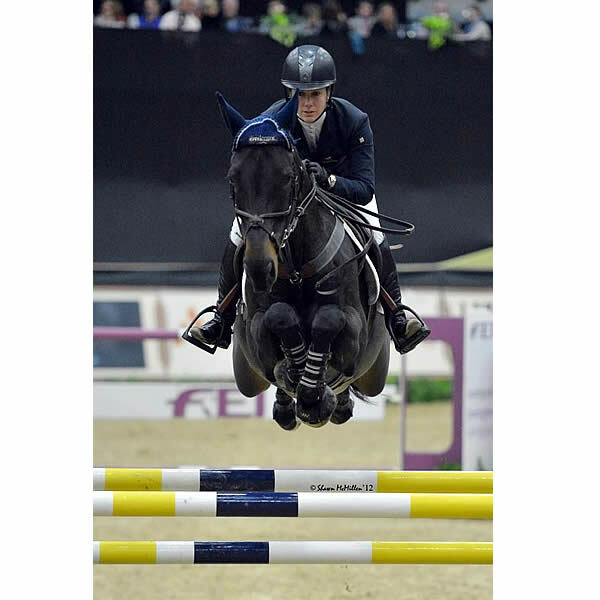 The pair won grand prix competitions at the FTI Consulting Winter Equestrian Festival this winter before traveling to Gothenburg and finishing fifth in the FEI World Cup Finals. This is their second major victory at Spruce Meadows. Competition continues tomorrow with the $33,000 Talisman Energy Cup 1.50m in Meadows on the Green, as well as the $10,000 CN ‘Fast Track’ 1.40m Junior/Amateur Derby and the $33,000 McDaniel & Associates 1.45m Derby in the All Canada Ring. For more information on Spruce Meadows and full results, please visit www.sprucemeadows.com. Kent Farrington and Blue Angel. Photos © Spruce Meadows Media Services. Calgary, AB – June 5, 2013 – The 2013 Spruce Meadows Summer Tournaments began today, and riding on new turf footing, riders contested four FEI-level competitions. For the third year in a row, Kent Farrington (USA) captured victory in the $33,000 ATB Financial Cup 1.50m, this year with Blue Angel. In the $33,000 Enbridge Cup 1.45m, McLain Ward (USA) was victorious with Super Trooper de Ness. Christine McCrea (USA) and Romantovich Take One won the $33,000 Bantrel Cup 1.45m, while Francois Mathy (BEL) on Polinska des Isles won the opening competition of the day, the $33,000 Friends of the Meadows Cup 1.60m. Watch a video of today’s highlights! The $33,000 ATB Financial Cup 1.45m was the highlight competition of the day and the final one in the International Ring. The course designer in the International Ring this week is Werner Deeg of Germany. There were 49 entries in the ATB Financial Cup, but only one made it through the first round without faults. With a tight time allowed in the first round, it was difficult to go clear without jumping or time faults, and nine entries finished with one time fault. Farrington and Blue Angel, an 11-year-old Warmblood mare by Luidam x Ascendent owned by Robin Parsky, posted a clear round in 77.968 seconds for victory. Darragh Kerins (IRL) and E Muze Yek, owned by Kerins and Maarten Huygens, were just over the 80-second time allowed in 80.899 seconds. Third place went to Charlie Jacobs (USA) on CMJ Sporthorse LLC’s Flaming Star, who crossed the timers in 81.918 seconds. Blue Angel will compete in her first team competition in next week’s Furusiyya FEI Nations Cup at the ‘Continental’ Tournament. It seemed like the rest of the field was going for second place after McLain Ward and Super Trooper de Ness, an 11-year-old Belgian Warmblood stallion by Vigo D’Arsouilles x Polydor owned by Grand Road Partners, galloped through the speed course in the $33,000 Enbridge Cup 1.45m. They went fifth in the order and stopped the timers in 64.310 seconds for victory, one second faster than second place finishers, Cadett 7 and Ashlee Bond (USA). Bond and Cadett 7, owned by Little Valley Farm, made a solid effort in 65.353 seconds and came closest to Ward’s time. Third place went to John Perez (COL) on Utopia, who finished in 67.474 seconds. Ward will continue to show Super Trooper de Ness this week with the aim toward preparing him for next week’s Furusiyya FEI Nations Cup. 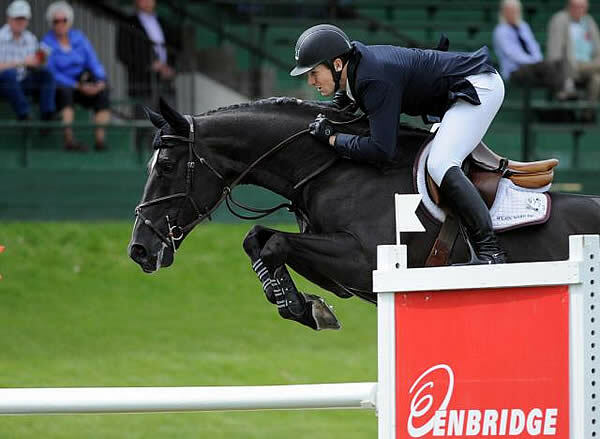 The $33,000 Enbridge Cup 1.45m was held in a speed format with 48 entries starting. The fastest clear round was posted by Christine McCrea and Romantovich Take One, a 13-year-old KWPN gelding by Numero Uno x Karandasj owned by Candy Tribble. They finished faster by a large margin in 64.855 seconds. Second place went to Remarkable Farms LP’s Nice de Prissey and Brianne Goutal (USA) in 68.266 seconds, while Reed Kessler (USA) and Wolf S, owned by Iron Works Partners, were third with a time of 68.478 seconds. McCrea did not watch anyone go before her since she was competing in another ring, but luckily she had the ride on Wannick WH earlier in the order, which gave her a good idea of how she could be faster with Romantovich Take One. It was a fast jump-off for the opening competition, the $33,000 Friends of the Meadows Cup 1.60m, in the International Ring for the ‘National’ Tournament with Belgium’s Francois Mathy Jr. galloping to the win on Polinska des Isles, a 10-year-old Selle Francais mare by Diamant de Semilly x Valespoir Malabry owned by Team Harmony and Francois Mathy. Mathy was one of five double clear rounds in a jump-off of nine entries. He and Polinska crossed the timers in 39.356 seconds, just edging out Olympian Reed Kessler (USA) and Cylana, who posted a time of 39.496 seconds. Third place went to Enrique Gonzalez (MEX) on Criptonite, who had a time of 41.892 seconds. Mathy competed with Polinska at the 2012 Spruce Meadows ‘Masters’ Tournament, so he felt comfortable taking her in the 1.60m in her first start out. “She knows the ring, which is a help when you start directly in a big class. The course was quite open, so I think that helped us get a bit into the rhythm,” he noted. Mathy plans to compete at all five weeks of the Summer Tournaments and was happy to win his first competition. “It’s a big investment for us when we come from Europe, so it’s super to start like that,” he remarked. The ‘National’ Tournament CSI 5* continues tomorrow with three main events: the $33,000 Prairie Mines & Royalty LTD Cup 1.50m, the $33,000 ATCO Pipelines Cup 1.45m, and the $35,000 Spectra Energy Cup 1.60m. For more information on Spruce Meadows and full results, please visit www.sprucemeadows.com. ©ESI Photography. 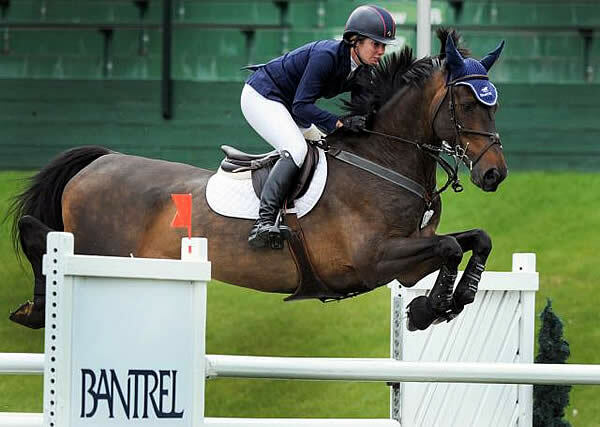 Christine McCrea and Avenir on their way to a two-for-two weekend at HITS Saugerties. SAUGERTIES, NY (May 27, 2013) – Christine McCrea finished the first week of spring competition at HITS Saugerties with a hot hand. After piloting Candy Tribble & Windsor Show Stables’ Avenir to the blue in Friday’s $25,000 SmartPak Grand Prix, presented by Zoetis, McCrea rose to the occasion again for Sunday’s $50,000 EMO Grand Prix and cashed another winner’s check. McCrea was the only rider to end the day with a double-clear effort. “I think I have found my new favorite course designer,” said McCrea with a smile after the class. Marina Azevedo of Campinas, Brazil set the courses in the Strongid C 2X Grand Prix Stadium this week, and admits that she attempted to make the tracks welcoming in the beginning of the season, but included some testing elements. “She uses the ground so well,” added McCrea. Azevedo set a 13-element course with 16 jumping efforts on Sunday, including a scopey triple at fence six and a double at fence nine. She also recycled a technical skinny vertical from Friday as the third-to-final fence. The scopey, technical track made for a nail-biting first half. The crowd that gathered on the berms of the Strongid C 2X Grand Prix Stadium waited nine trips before seeing the first clear round of the day. 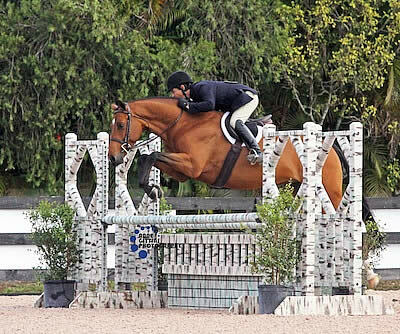 Peter Wylde of Wellington, Florida was the first to crack Azevedo’s code in Friday’s $25,000 SmartPak Grand Prix and got it done again on Sunday with Societe Cirile de Necurie de Meautry’s Lewin 5. 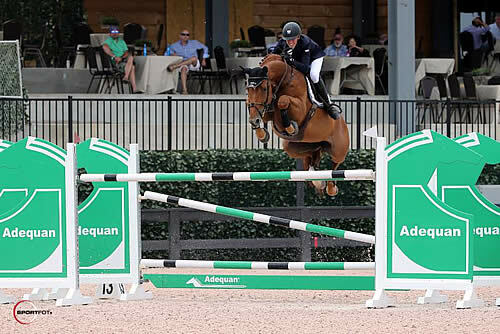 McCrea was quick to secure a jump-off in the next trip to later be joined by Margie Engle of Wellington, Florida on Gladewinds Farm, Inc.’s Indigo and Candice King, also hailing from Wellington, Florida, aboard Stateside Farm, LLC’s Campbell VDL. Wylde returned first in the jump-off and had the makings of a winning ride until a heart-breaking rail fell at the final fence, a wide oxer as he galloped home and ultimately landed him and Lewin 5 in third. McCrea returned next and set a blazing Great American Time to Beat at 37.66 seconds. While she was the only rider to go clear in the jump-off, her time also went untouched. Engle and Indigo were third to return for the short course and were in prime position to beat the clock, but picked up four faults with a rail at the fourth jump. King and Campbell VDL batted clean-up in the jump-off and were on track to a clear round before the final oxer reared its ugly head again and handed her four faults. Engle landed second, while King finished fourth. The fastest of the four-fault rounds over the original course, Kevin Babington of Keene, Kentucky rode his own Mark Q to fifth. Grand prix competition continues next week at HITS-on-the-Hudson with the $25,000 SmartPak Grand Prix, presented by Zoetis, on Friday and the $75,000 HITS Grand Prix, presented by Zoetis, on Sunday. Qualifying for September’s Zoetis $1 Million Grand Prix has begun to reach its pinnacle as the HITS Saugerties circuit will feature two weekly qualifying opportunities in the first seven weeks of the circuit with one final Wild Card class on the Friday before the Zoetis Million. Follow all the qualifying action at HitsShows.com. 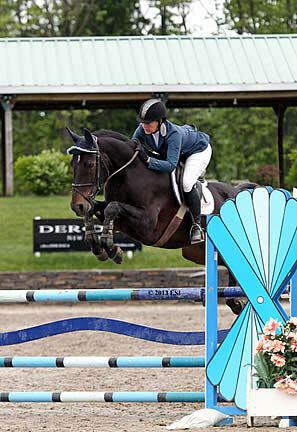 No stranger to Marshall & Sterling Jumper Classic success, Alissa Kinsey of Danville, New Hampshire rode her own Grisset to top honors in Saturday’s $10,000 offering. She was the best of 26 who showed over the 1.10m course. Kinsey was one of six to advance to the jump-off, which came down to raw speed. Five of the six were double clear, but Kinsey was the fastest by over two seconds. She posted a time of 28.98 seconds. Behind her in second was Angelena DaPrato of Annandale, New Jersey, who rode her own Red Bull to a final time of 30.79 seconds. Tammy Kelly of Long Valley, New Jersey and Kimberly Seay’s Belvedere were third in a time of 33.60 seconds. Rounding out the top five was Mackenzie Burns of Blairstown, New Jersey on her own Zaloubet Zaffiro in fourth and Lisbeth Hume of Nanuet, New York in the irons of her own Sonny in fifth. Burns posted a time of 35.36 seconds, while Lisbeth rode to 35.51 seconds. ©ESI Photography. 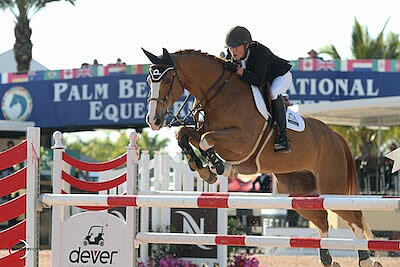 Christine McCrea and Avenir jump their way to a blue in the $25,000 SmartPak Grand Prix. SAUGERTIES, NY (May 25, 2013) – Excitement surrounding Week I of the HITS Saugerties Spring and Summer Circuit reached a climax Friday afternoon when 26 riders took to the Strongid C 2X Grand Prix Stadium to get grand prix competition underway at HITS-on-the-Hudson with the $25,000 SmartPak Grand Prix, presented by Zoetis. Christine McCrea and Avenir, owned by Candy Tribble & Windsor Show Stables, Inc., pocketed the first high-performance blue of the 2013 season. McCrea of East Windsor, Connecticut rode sixth in the first-round order and posted the second clear round after Peter Wylde of Wellington, Florida was first to leave the rails up on Lewin 5, owned by Societe Cirile de Necurie de Meautry. Eight others joined them for a 10-horse jump-off, which left McCrea as one of only two double clear rounds. With the north berm of the grand prix stadium now boasting a new and improved VIP Club, exhibitors and spectators alike gathered to watch Marina Azevedo of Campinas, Brazil test both horse and rider. She built a 13-obstacle course with 16 jumping efforts, including a double early in the course at fence three and a triple combination at fence 12. While fair for $25,000, McCrea noted that Azevedo offered some challenges, including tricky striding between fences seven and eight, and technical combinations. “I had a pretty fair plan when I entered the ring – I really slowed up coming into the triple (a vertical, vertical, oxer), got Avenir under control, balanced and it worked out great in the end,” she said. McCrea returned second in the jump-off and set an early Great American Time to Beat at 34.95 seconds. Jonathan Corrigan of Oyster Bay, New York was quick to challenge in the next trip on Sagamore Farm’s Olympic De Chamant. They were clear, but couldn’t catch McCrea and Avenir. They posted a time of 35.92 seconds to settle for second. Kevin Babington of Keene, Kentucky was the fastest of the four-faulters and rode Mark Q to third. Laura Chapot of Neshanic Station, New Jersey picked up four faults with Quointreau Un Prince, owned by Chapot and McLain Ward, and finished fourth. Heather Caristo-Williams of Saugerties, New York rounded out the top five with a single rail aboard Mr. & Mrs. Ralph Caristo’s Evening Star. Todd Minikus of Loxahatchee, Florida got things started on Wednesday in the $10,000 Brook Ledge Open Welcome. He rode his own Quality Girl to the top and cashed a $2,800 check. Laura Chapot dominated the top three with a second-place ride in the irons of Mary Chapot’s Umberto and was third with Mary Chapot’s Shooting Star. Peter Wylde was fourth aboard Lewin 5, and Far Hills, New Jersey’s Ronan McGuigan capped the top five on his own Capall Zidane. 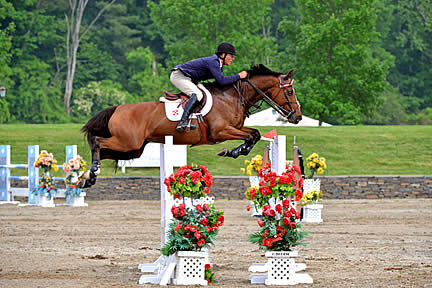 Brook Ledge Horse Transportation presents weekly jumper classes at HITS Saugerties. Aside from the winner’s purse, Brook Ledge Open Jumper riders also compete for the Brook Ledge Rider Bonus. The award, given at the conclusion of the circuit, includes a $1,500 shipping credit for the rider who accumulates the most points in those classes throughout the HITS Saugerties circuit. Grand prix competition continues Sunday at HITS-on-the-Hudson with the $50,000 EMO Grand Prix, presented by Zoetis, and commences qualifying crunch time for September’s Zoetis $1 Million Grand Prix. The first seven weeks of the HITS Saugerties circuit will feature two weekly qualifying opportunities with one final Wild Card class the Friday before the Zoetis Million. Follow all the qualifying action at HitsShows.com. The Alltech National Horse Show concluded on Sunday, November 4, after a highly successful six-day run at the Alltech Arena at the world-renowned Kentucky Horse Park in Lexington, site of the 2010 Alltech FEI World Equestrian Games. Martha Jolicoeur’s award was presented on Saturday night, following the victory gallop for the $250,000 Alltech National Horse Show Grand Prix. McLain Ward riding Antares F, raced to a brilliant win.